Legislator and PRD secretary general Pedro Miguel González, the maker of the motion, is for now the big winner in this. The vote to reconfigure the Credentials Committee had been postponed, with the appearance that he did not have the votes. But he did and now as an opposition leader he retains credibility and wields enhanced bargaining power. Photo by the Asamblea Nacional. In the middle of 2014 the Varela years began with some deals in the legislature that prevented Ricardo Martinelli, who was blackmailing the members of his Cambio Democratico party’s legislative caucus with the claimed contents on surveillance files he had on all of them, from making Panama ungovernable. It its first version the governability pact was mainly a deal between the Democratic Revolutionary Party caucus, with just over one-third of the deputies and the president’s substantially smaller Panameñista caucus, plus a few others. That first deal left most of the Cambio Democratico deputies unhappy because it cut them out of most of the political patronage perks, which form the reason why most of them were ever with Martinelli in the first place. Goodies were distributed, Martinelli’s hand was weakened by the removal and imprisonment of his main main on the Supreme Court, Alejandro Moncada Luna, and then much more so when he fled the country. Power struggles ensued within the PRD and CD, making for some tricky bargaining. Martinelli and PRD deputy Benicio Robinson though that they had a deal to take over the legislature and impeach Varela, but it turned out that neither could muster the needed votes from their respective parties. Instead an alliance of Panameñistas, PRD dissidents and CD dissidents cobbled togehter shaky coalitions while both the PRD and CD were engaged in internal faction fights. In both of those opposition parties the dissidents won the power struggles. In the PRD legislator Pedro Miguel González eclipsed Robinson and in CD Rómulo Roux ousted Martinelli as president of the party he had founded and always led. In mid-2017 the governability pact continued, but with González vowing to lead his party into opposition. The very immportant Credentials Committee, which can pass presidential nominations for high court magistrates on to the National Assembly as a whole or bottle them up and asphyxiate them, was configured last July to include four Panameñistas, three PRD members and two CD deputies. But the thing is, Article 162 of the Panamanian Constitution plus a couple of provisions of the legislature’s own rules state that the allocation of committee seats should be roughly proportional to the partisan composition of the assembly. However, Varela’s party holds only 16 seats, as against 25 each for CD and the PRD. An independent and a few “others” round out the 72-member legislature. Strictly speaking, four of the nine seats on the Credentials Committee for the Panameñistas is illegal. But last summer there was a five-day window of opportunity for objections to the committee’s composition and that came and went without anyone challenging the division. After that brief window, Martinelli was jailed in Miami to await or perhaps avoid extradition, additional witnesses and documents came forth to make the case that Varela took millions from the hoodlum Brazilian company Odebrecht and Varela moved to strengthen his weakening had by two Supreme Court appointments, one of a manifestly unqualified legal thinker who on the other hand was a loyal Panameñista, the other the top anti-corruption prosecutor whose promotion would wreak havoc on many public corruption cases. The Credentials Committee, on the margin of the four Panameñistas and one CD dissident against four opposed, said yes. The plenum of the National Assembly said no and suddenly all of the old deals were off. PRD leader González moved to reconfigure the Credentials Committee, something never before attempted in the midst of a legislative session. It matters not only because that committee must first pass on the next couple of nominees that Varela may come up with to fill the high court vacancies. The Credentials Committee also decides whether a Supreme Court magistrate or the president of Panama may be impeached before the National Assembly as a whole. The Panameñistas walked out of the legislature’s chamber, a few mostly CD deputies were absent and the vote to reconfigure the Credentials Committee was 45 in favor, on CD dissident against, and independent Ana Matilde Gómez and Partido Popular deputy Juan Carlos Arango abstaining. 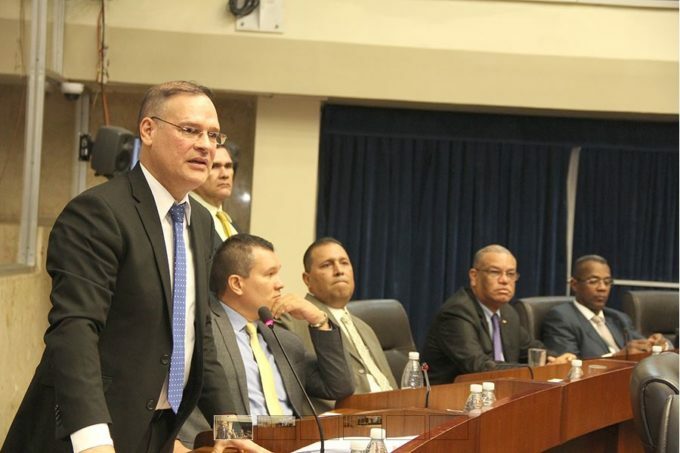 The resolution that passed gives three seats to the PRD, three to CD, two to the Panameñistas one for someone who is not affiliated with any of the main caucuses — Gómez or Arango. The Panamaeñistas say that they will file an “amparo de garantías,” a summary challenge to the move’s constitutionality. If any high court magistrate decides to accept the case, then there is a stay and the resolution is suspended pending a further decision of the court. The probable result of such a suspension would be any Varela nomination, and perhaps some ordinary government housekeeping bills coming from the president, being dead on arrival. What a mess! Perfect for horse trading that gets benefits for one’s self or constituency, when you think about it. But is that what the legislature wants to do? Most probably those who voted for González’s resolution each have his or her own particular mix of reasons. Do they want to shape the composition of the Supreme Court more to their liking? Do they want local projects funded so that they can run for re-election with something to show the voters? Are they in a nihilistic mood to disrupt the government? Have they at long last been moved to confront the rampant courruption in one or more impeachment trials? What will happen remains to be seen. What has happened is that the hand of President Varela and his party has been dramatically weakened in the legislature.